But five years ago, she joined a government-led initiative, supported by the United Nations Population Fund (UNFPA), that aimed to educate women in far-flung communities about safe pregnancy and childbirth. Crucially, she learned to encourage all pregnant women to visit professional health care providers. 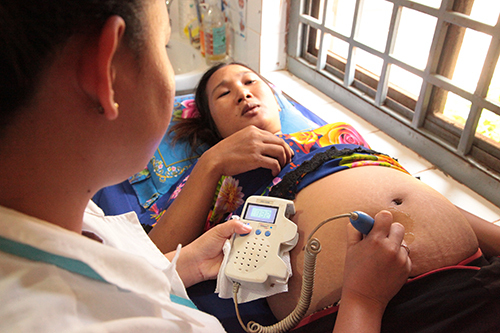 Cambodia has made huge gains in bringing down maternal mortality. “In 1990, Cambodia’s maternal death rate was right up at around 1,200 women dying per every 100,000 live births,” said Catherine Breen Kamkong, UNFPA’s Deputy Representative in Cambodia. By 2015, it was about 161 per 100,000 live births. According to the latest data, nearly 90% of all births in Cambodia now take place under the care of a skilled birth attendant. But in remote provinces like Rattanakiri, progress is only just starting to show. “We’ve had zero maternal deaths in our district so far this year,” said Dr. Lek Chanthy at the Borkeo district hospital, which covers a population of around 70,000 in Rattanakiri. “But language barriers, traditional practices and a lack of education are still serious challenges.” There are nearly 195,000 people in the province, over half from indigenous groups. Many stick closely to traditional lifestyles: farm work, early unions and home births. Romam Phel, 17, is poised to become one of these young mothers. She was married at 16, and is now seven months pregnant. “I think my time came, and we just fell in love,” she said about her early marriage. “I wanted to have children straight away after our wedding.” Ms. Pcheuk is encouraging her to give birth in a health facility. Today, UNFPA, the government and partners are focusing on remote and underserved regions, increasing the number of midwives trained to deal with complicated births and doctors who can perform emergency cesarean sections. This post originally appeared on the UNFPA website.